In the first week of September 2017, a mission of experts visited Peru from Kenya to learn about best practice in food security, and coordinated productive development programmes that the Government of Peru is running in the country. 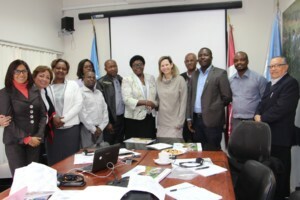 The South-South Cooperation mission, made up of eight officials from the Kenyan Ministry of Agriculture, Farming and Fishing, was arranged by the Food and Agriculture Organization in collaboration with the Peruvian Agency for International Cooperation (APCI). The South-South Cooperation mission from Kenya also met Maria Eugenia Mujica, Vice-Minister of Policy and Social Evaluation at the Ministry of Social Development and Inclusion (MIDIS), and Peru’s SUN Government Focal Point, to learn in detail how social policy is implemented in Peru. ‘We have learned that almost all social policy that contributes to food security for the most vulnerable is designed by the national government but implemented in close coordination with other sectors and regional governments. This is done through mechanisms such as the Interministerial Committee for Social Affairs (CIAS), regional government executives (GOREs) and stimulus funds for sub-national governments’, the Kenyan official says. Eduardo Sal y Rosas, Director of International Management and Negotiation at the APCI. The Kenyan officials also had the opportunity to talk to Federico Arnillas to find out about the work of the Roundtable for the Fight against Poverty (MCLCP) in depth. ‘Organized civil society takes food security very seriously and has a very active role in this work. It monitors budget lines for the issue nationally and locally, and also ensures that the results are monitored. All stakeholders take responsibility for the process and the government ensures that they have the resources they need to do the work’, emphasizes Mulat Demeke, Senior Agricultural Policy Officer at the Food and Agriculture Organization in Kenya. The Kenyan officials were also welcomed by the Ministry of Agriculture and Irrigation’s Director of Agricultural Policy and Regulation, Javier Martínez, to learn about the Ministry’s decentralized management and its mechanisms for coordinating with regional and local governments. ‘I think they were particularly interested in the intersectoral and intergovernmental work carried out through the Multisectoral Commission on Food Security, both nationally and through regional committees’, says Martínez. ‘The regional committees are led by regional governments but they take on as many ministerial requests as they do matters that they have prioritized themselves. That is the winning formula: prioritizing objectives regionally and getting sectoral support for those objectives from the relevant ministries’, he concludes. ‘We are about to set up a commission like this one in our country too. I think Peru’s experience is very relevant because they have managed to involve all sectors linked to food security and establish a solid institutional structure, which must be led by decentralized governments’, says Mary Mwale, a nutrition specialist at the Kenyan Ministry of Agriculture, Farming and Fishing.